Christmas has come and gone, which means I can write about the socks I made as a gift. My sister always has handmade socks on her list; between myself and a couple other knitters in the family, I think she receives a pair more years than not. This was one of those years. It was after Thanksgiving when I knew I’d have time to knit a pair of socks, but that means I no longer had much time for yarn shopping. In my stash, I found two balls of Plymouth Yarn Dancing Toes that I had dyed with Kool-Aid for previous projects. One has speckles of color while the other features long stripes. The colors aren’t an exact match, but they could potentially work well together. 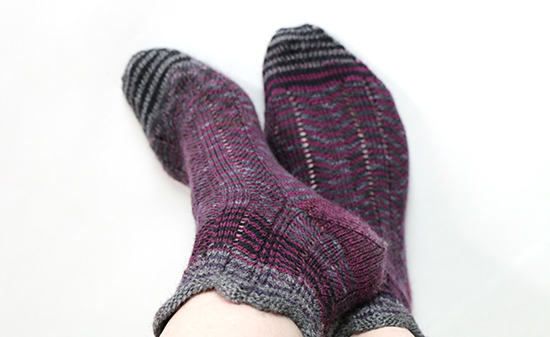 I knitted with both yarn balls at once, alternating every two rows, making bright and playful stripes accented by slipped stitches in the Whirlpool Socks pattern by Laura Nelkin. The downside was that this yarn felts easily, forcing me to make the socks a bit larger than I usually would. I was just rounding the heel on the first sock when I came to conclusion that I wouldn’t have enough yarn to finish. Back to square one with the Christmas deadline coming up quickly, I pulled together some other coordinating yarns in purples, grays and blacks. 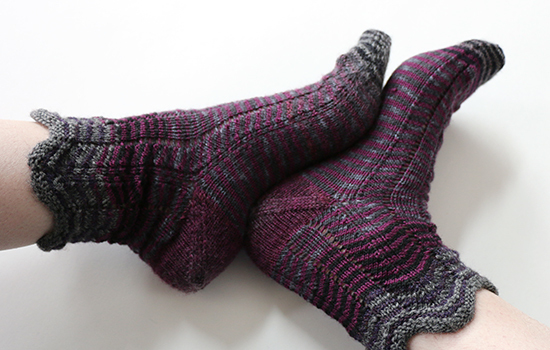 I switched to a chevron pattern: Waves and Piers Socks by Charlene Schurch and Beth Parrott. I had small quantities of at least six yarns — there was no way I was going to run out of yarn with this combination! By splitting each color into two roughly equal balls, I was able to follow the same basic color pattern on each sock. Once again, I alternated colors every two rows to create stripes. The pattern incorporates a forethought heel, which I had attempted once before and disliked because of the many needles and yarn ends involved. I made it through the process on both socks this time. It will never be my go-to heel technique but, like so many other things in life, it gets easier with practice. I haven’t spoken with my sister yet as I write this, but I hope she’s as happy with the socks as I am. And I hope she doesn't mind seeing photographic evidence that I tried them on before giving them to her! I’m still thinking about the brighter color combination. Who knows what that might become by this time next year? Congrats! on your newly completed socks. Thank you! I saw my sister just after Christmas and she likes them.